Quezada takes readers on a journey deep into the world of the U.S. immigration system. Follow her as she walks alongside her new friend, meets with lawyers, stands at the U.S.-Mexico border, and visits immigrants in detention centers. 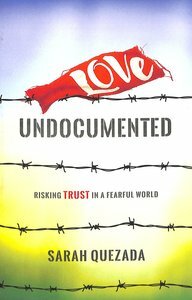 About "Love Undocumented: Risking Trust in a Fearful World"
Sarah Quezada is a writer and nonprofit professional in Atlanta, Georgia. Her writing has been published in Christianity Today, Relevant, Sojourners, SheLoves, and InTouch Ministries, among others, and she has worked with Azusa Pacific University, Mission Year, and the Christian Community Development Association. She and her husband, Billy, facilitate visits to immigrant detainees at Stewart Detention Center in partnership with El Refugio Ministry, and are the parents of two children.